If you are a British nation in Spain then you would be pleased to note that the British Embassy in Spain is located in Madrid. Should you have problems with the law or in need or consular assistance then the embassy in Madrid will be able to assist you with registration of a marriage, public notary, registration of a death and also the birth of your child. If you have retired in Spain and now need consular services such as a public notary, official documents from home then the location of the embassy and their contact details are listed below with a map to the embassy. Note that the Canadian embassy is not to far from the British embassy. If you find the one the other one is across the road from it. There are a number of British Consulates in Spain. These include the British Consulate in Madrid as well as the British Consulate in Alicante. There is also a British Consulate in Barcelona and a British Consulate in Ibiza which is a popular tourist destination in Spain for the British. Spain is also host to the British Consulate in Las Palmas de Gran Canaria as well as the British Consulate in Malaga. The last two are much smaller being the British Consulate in Santa Cruz de Tenerife and the British Consulate in Palma de Mallorca also in Spain. Spain is a large retirement destination for the British with a lower cost of living and much better weather than the UK. It is also the tourist destination for some of Europe’s largest parties. With this comes its own problems. See the British Abroad report on this website. 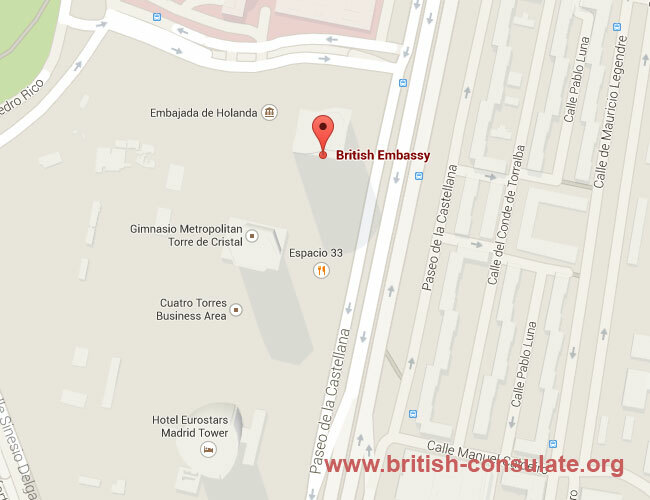 Note that the British Embassy in Spain and the British Consulate in Madrid are in the same location. The telephone numbers however are not the same. Email the British Embassy in Madrid for more information and assistance else the Consulate.